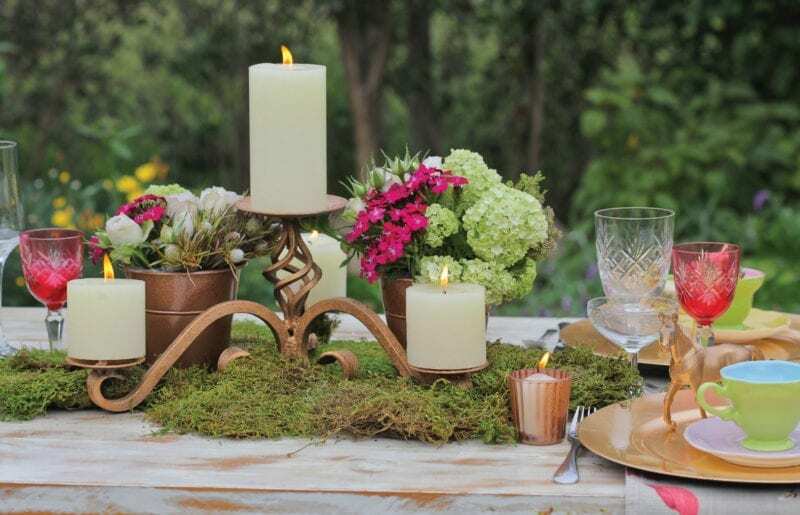 Table décor can make your festive party an extra special event. We borrowed this idea from Jamie Oliver’s wooden plants on bricks to serve antipasto and took it one step forward by adding flowers peeking from underneath to give it an elegant touch. Measure the table and cut planks to fit the length. We used old painted planks that we sanded down to the wood so that we could put food on the top. Set the planks onto bricks spaced evenly so that the structure is stable. Soak oasis in water and cut to fit a flat container that can take water for the flowers. You don’t need much on each side of the container. Place the flowers on either side making sure the stems are long enough to peek out once the planks are in place. We used camellia leaves as the greenery, then filled in with white roses, chrysanthemums and Geraldton wax flowers. 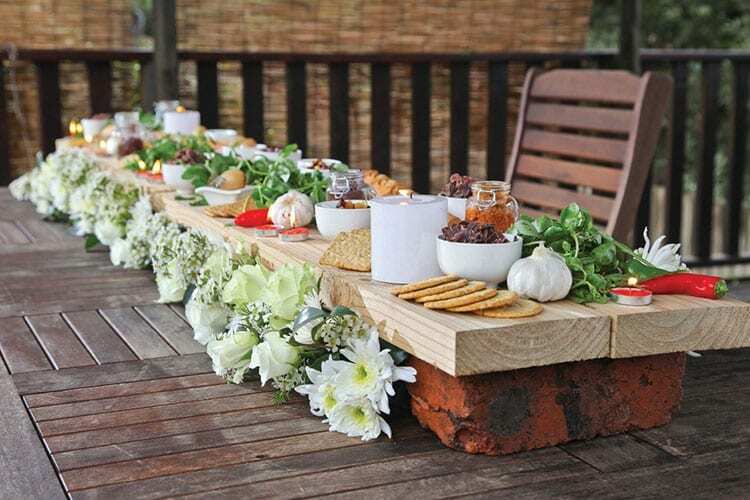 Place the planks onto the structure and add an array of tasty bits – olives, dips, salad leaves, biltong, nuts and fruit, breads, biscuits, cheese – anything you fancy. 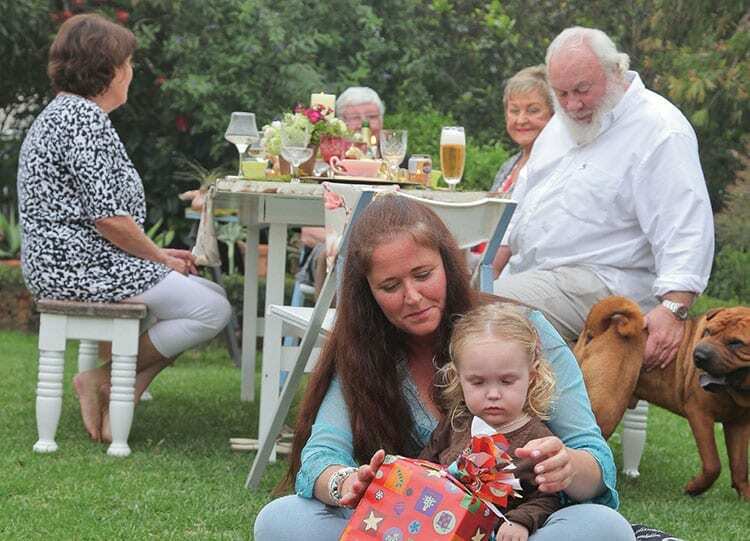 The trick is to look around your house and garden for stuff that can be quickly jazzed up into interesting party decor items. Collect any rusting or odd objects that have been sitting on the stoep for ages, as well as recycled glass jars hoarded in a kitchen cupboard. We sprayed old candlesticks, birdcages, plant pots and plastic toys with aerosol spray paint in shades of dull gold and copper – copper has been quite a trendy colour the past few years! For a serving table, an old wooden garden gate resting on two trestles was painted with charcoal-coloured chalk paint. Chalk paint is very easy to use – there’s no preparation before painting. As botanical prints have been so in vogue, I sewed oversized linen serviettes with a pretty magnolia print on them, and bought cheap, copper-coloured plastic plates to use as table settings. Dried florist moss and small wooden discs supply a ‘mossy table cloth’ reminiscent of a relaxing escape to a forest floor. Rusted tin boxes and glass bottles are vases for a mish-mash of fresh cut flowers and greenery from the garden.